With all the fuss surrounding the Apple event today, you may have forgotten that an equally big announcement is coming next week. And we are first to deliver you a glimpse of what is to come at the Samsung Unpacked event, which will see the unveiling of the next Google flagship - Nexus Prime. What you are seeing here is the first live photo of the Nexus Prime (or part of it), which comes to confirm several important specs of the upcoming device. First, we've got the HD resolution of the Super AMOLED confirmed - that's 720p on a screen just 4.6" in diagonal. As you can see from the image itself this gives you a pixel density of over 320 ppi, which is certainly more than anyone could need. And don't be confused by the strange 1184 x 720 pixels resolution that appears on the system info. That's just the active area of the screen, with the status bar on the top and the three soft buttons on the bottom not counted. 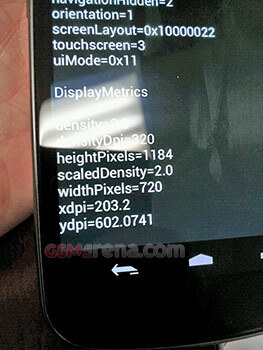 The Samsung Nexus Prime will surely come with a regular 1280 x 720 pixels screen. We are not sure if the Samsung Nexus Prime display will be using the PenTile matrix, but we can bet that at this pixel density even the most eagle-eyed users won't be able to tell the difference. Just look at the shot, those letters look like printed on paper. The final bit that we found out is that the Nexus Prime won't be having any hardware keys on the front. This was probably to be expected as Android Ice Cream Sandwich is based on Android Honeycomb, which doesn't rely on hardware controls for UI navigation. It will certainly be a fierce battle between this beast and the upcoming iPhone(s). Update: Click the image to view a larger size version. some of us like to do more then make calls on our phones. samsung you rock...keep up the good work. smack iphone a couple time for me! Why do they keep making the freaking phones bigger!!! makes no sense if I want to walk with a tablet I'll buy a tablet!!!! Lets keep the phones at 120mm max... I just don;t understand!